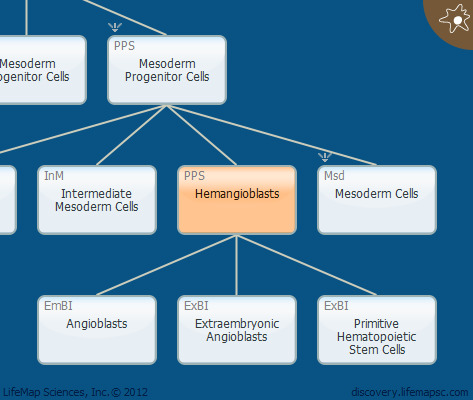 Hemangioblasts are multipotent cells which give rise to both hematopoietic and endothelial cells. In the mouse, the earliest endothelial precursor marker is the Flk1 VEGF receptor (VEGFR-2). These cells form a subset of brachyury-positive cells in the primitive streak. The differentiating hemangioblasts then migrate into the extra-embryonic yolk sac to form blood islands composed of hematopoietic and endothelial cells. Genetic ablation of the Flk1 VEGF receptor results in the absence of both endothelial and hemopoietic cells in the mouse embryo and in death between E8.5 and E9.5. This finding indicates an essential role for Flk1 and members of the VEGF family in the development of both cell lineages. Heterozygous inactivation of VEGF also results in arrested vasculogenesis and to eventual embryonic lethality, indicating that VEGF is required for vascular patterning and assembly.